Type: Combat Skill (paranormal): a pair of paralyzing eyebrows. One day, a peculiar character, whom everyone mocked and ridiculed, tripped over a rope that some idiot had left across the path. 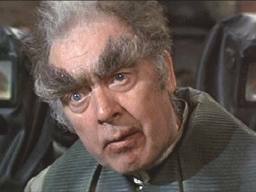 After tracing the rope to its origin, the peculiar character was surprised to discover that it originated in the hair of his own eyebrows. As he shook his head in utter astonishment, his eyebrows cracked like twin bullwhips, vining along the ground and raising a thick cloud of dust. Inspiration struck, and, without thinking, he invented a skill of the same name. The hero who desires to learn the Liana-eyebrows skill must first grow a pair of eyebrows of prodigious length and thickness. Wandering masters who teach this skill, for instance, have eyebrows that can span the road between two taverns or even between milestones. When eyebrows grow to a sufficient length, practitioners may begin with simple exercises, such as hiring livestock from a shepherd or a cowherd and controlling the animals with shakes of the head to crack the eyebrows. Once the hero achieves control in this manner and becomes reasonably certain of not whipping himself or herself in the face on a regular basis, he or she may move onto more advanced exercises, consisting of lashing the eyebrows without moving his or her head. The movement of the eyebrow independently, one at a time, is called "normal" Liana-eyebrows, and the movement of the eyebrows independently at the same time is called "paranormal" Liana-eyebrows. The highest level of skill development can be extremely difficult for a hero to attain, as it requires intense training to cause the eyebrows to perform specific attacks. The best recognized attack of the master Liana-eyebrows practitioner is the soundless slithering of eyebrows around the unaware enemy, until the creeper-like eyebrows completely wrap their victim and squeeze in the manner of boa constrictors. Those attacked this way experience a moment of panic and then an intense euphoria that they take to their graves. Those rescued or released from such an attack have been found to have simply been stunned and paralyzed by an unknown mechanism of the Liana-eyebrows. The above is lifted directly from the Russian Godwiki article page for the same skill, to satisfy the curiosity of holders of this skill. Translation by Google Translate, syntactical/cultural smoothing by the submitter. "Liana" has long been thought to refer to a specific person. However, in this case "liana" translates specifically to "vine" or "creeper," indicating that the name "Liana" in Russian may be like the name "Willow" in English: meaning long, supple, and flexible. Here, in Godville as part of "liana-eyebrows," it does not to refer to any woman, and is rather a Cyrillic transliteration. Were this skill of English language origin, it would most likely have been "lashing eyebrows" or "eyebrow whips." This page was last edited on 2 January 2019, at 04:17.